The best performing ergonomic mats on the market today. 100% satisfaction guaranteed. * Guaranteed against wear for five years of continuous usage in non-abrasive and dry environments. Retains elasticity, providing continuous ergonomic support. Withstands temperatures from -32° to 175°F. Meets EOS/ESD DS-7.1 1994 standards for static dissipation. Not for use where chemical resistance is necessary or in wet environments. Color: black. 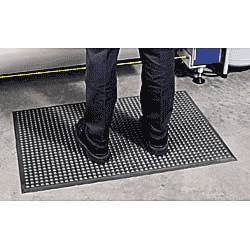 PRE-CUT MATS ARE IN STOCK. Others FOB OHIO.